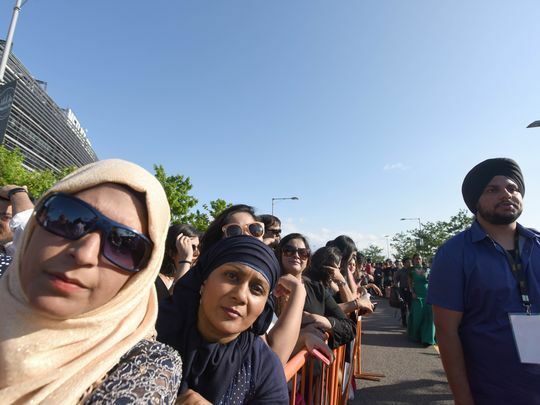 Purva Shah and her family paid $13,500 and flew 21 hours from India to spend a hot summer afternoon in the MetLife Stadium parking lot. As everyone from East Rutherford and Ho-Ho-Kus knows, this is a rather terrible idea, since the parking lot offers no water and no shade, only heat rippling down from the sky and up from the asphalt. Shah, her brother, Harnil, and her father, Rakesh, a construction magnate from Ahmedabad, a city of 5.6 million people in western India, did not seem to care. This, in fact, was the high point of their month-long trip to the United States. 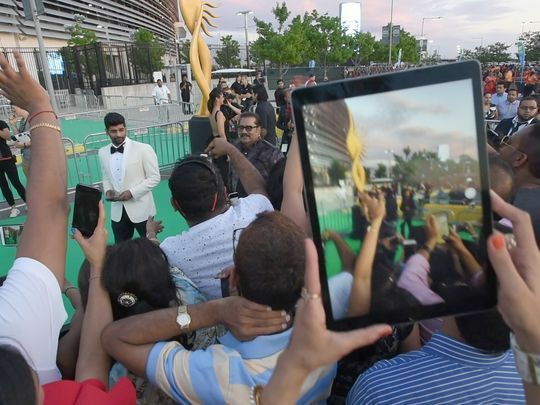 On Saturday evening they stood at the edge of the parking lot in the VIP viewing section of the 18th annual International Indian Film Academy Awards — the Oscars of Bollywood — and smiled. The Shahs stood just a few feet away when Shahid Kapoor and Taapsee Pannu, two rising Bollywood movie stars, descended from sprawling black Lincoln limousines. Now they hoped to see the biggest Bollywood celebrity of all, Salman Khan, a musclebound leading man and star of 108 action and romance movies over his 29-year career. If they were lucky, perhaps they could reach across the steel security barricade and touch the great man’s arm. The Bollywood Oscars came to MetLife Stadium for two nights this weekend. Other events were held in Times Square and in midtown Manhattan. All of the gatherings were like this, a curious mix of intimate proximity and massive spectacle, as the biggest film industry in the world put on its biggest show of the year, only to be swallowed up by this big city and this big stadium and be rendered small. 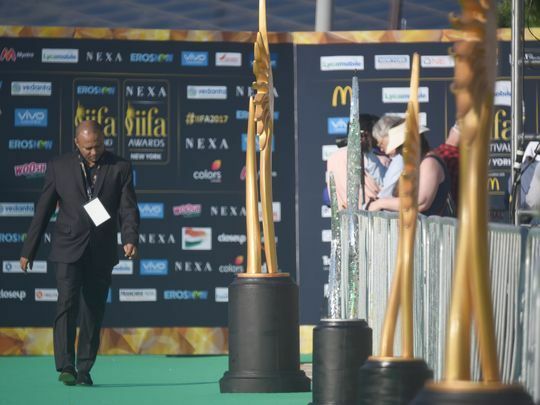 At www.iifa.com, the home page of the awards, Photoshopped images showed the Statue of Liberty’s torch replaced by a statue of the rising sun, which is to Bollywood’s Academy Awards as the golden Oscar is to Hollywood’s. Another image showed crowds of Bollywood fans shutting down Times Square as if it were New Year’s Eve. Outside the stadium, security seemed tight. Guards with clear plastic microphones in their ears shoved and shouted at journalists, hundreds of whom jostled one another to get inside. Bollywood is the world’s largest film industry, releasing 1,000 movies and entertaining billions of people every year. But if the industry’s leaders set their sights on taking over New York, they did not quite succeed. Instead, a few hundred people stood in the pedestrian plaza on Broadway in Times Square on Friday night and watched a dozen Bollywood dancers bop in unison. At MetLife Stadium, the stage was overwhelmingly large, with dozens of LED screens standing hundreds of feet tall to recreate a panoramic facsimile of Times Square. The stage stood on the 50-yard line, however, leaving the northern half of the stadium in empty shadow. Ticket prices started at $75 for seats in the nosebleeds and reached $5,000 for a seat on the field. Hundreds of fans without tickets got even closer access, however. They stood outside the stadium gate and chanted the names of their favorite actors, who paced for the cameras just a few feet away. In other ways, the Bollywood Oscars were strikingly similar to their Hollywood counterparts. Both shows feature long carpets on which celebrities parade and pose. In Hollywood the carpet is red; in East Rutherford it was green. And at both shows, stars appear in sequined ball gowns and ornate suits and pretend to have intimate conversations with other stars. Natasha Suri, winner of the 2006 Miss India pageant, stood at the end of the line in high heels and a raspberry-colored dress. She towered above all the other celebrities and held a microphone in her right hand. Bollywood and Hollywood also have their pecking orders of fame. For many years Tom Cruise, the diminutive star from Glen Ridge, stood at or near Hollywood’s apex. This weekend in East Rutherford, the top spot was dominated by Salman Khan. In dozens of interviews, fans said they hoped to catch even a tiny glimpse of Khan. Kishore, the TV news host, described winning a one-minute interview with Khan as the biggest “get” of the night, and he had deployed half his staff to the task. Confronting the summer heat and the throngs of fans and a phalanx of unfriendly security personnel, two Bollywood outsiders bumbled their way through the stadium gate, past the cavalry of television camera crews and into the stadium’s gray sanctum. They found themselves backstage, alone, in a place they were quite sure they were not allowed to be. Dancers in red feathers and limousine drivers in black suits passed the two interlopers in the narrow hallway. One interloper turned to his left and locked eyes with Salman Khan, Bollywood’s big star. Khan was surrounded by a scrum of larger men, leaving visible only his smiling mouth and wide-open eyes. The onlooker was surprised to find himself looking down at this titan of film. Salman Khan, like his fellow action movie star Tom Cruise, stands 5 feet 7 inches tall.